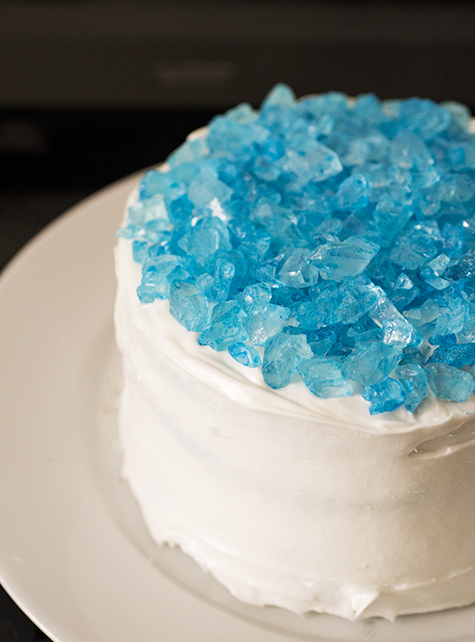 They call it cooking meth, but really, it’s a lot more like baking. He approaches food intuitively, which is why he’s never liked baking—it’s too precise. You can’t throw in a pinch of this, a pinch of that, eyeball a teaspoon of baking powder, and leave it in the oven until it looks done. 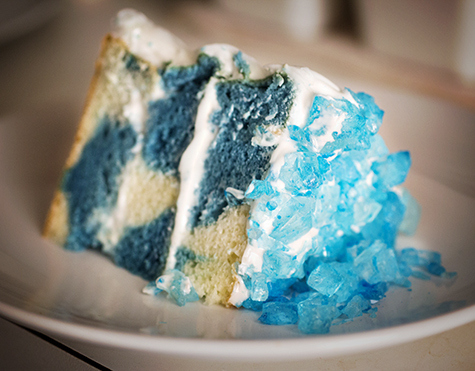 Walter White would be an incredible baker. Baking relies on precision. Four ounces of flour is always four ounces of flour. At the right temperature, butter and sugar become light and fluffy perfection in three minutes. I can make a sheet of cookies and recreate them a year later, at a friend’s house, on the other side of the country. I love that different ratios of the same basic ingredients—butter, flour, sugar, eggs—result in a million different desserts. I think it’s incredible that a touch of salt makes chocolate sing, but a spoonful ruins ganache. Everything from the humidity of a kitchen to the size of the eggs to the style of whisk makes a difference. Who knew the art of pastry was such an exact science? 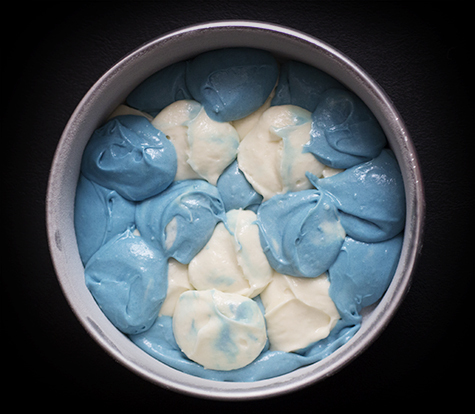 For some cooks, the exactitude of baking stifles their creativity. I like it. The chemistry excites me, challenges me. I think it’s sort of cool. Maybe that’s why I look forward to the meth cook montages on Breaking Bad. Walt and Jesse might be making a questionable product, but I can’t help admiring their process. Plus, the visuals are stunning: glittering aluminum strips rain like confetti, gas bubbles through clear hose, yellow smoke puffs out a vent. Even the finished drug is pretty, big and opaque as blue raspberry rock candy. Actually, it’s exactly like rock candy—that’s literally what they use for meth on the show. The first time I saw it, I thought to myself, that’d look neat incorporated into a dessert. I pictured a cake, frosted pure white and topped with lots of sparkly blue crystals, marbled navy and white inside. But it wasn’t until now, as the second half of the last season is about to start, that I went for it. My boyfriend took the first bite. I could hear the rock candy crunching between his teeth as he slowly nodded, eyes widening. He didn’t say anything, just took another bite, and I knew he was hooked. 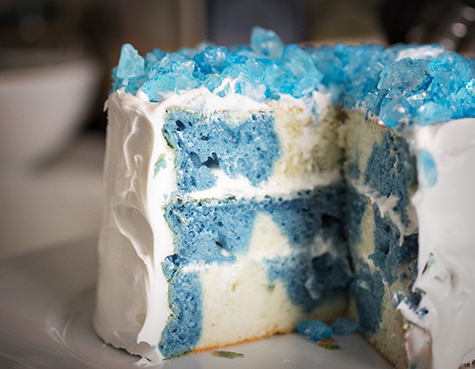 The finished cake isn’t as chemically sound as Heisenberg’s Blue Sky. Maybe because I mixed it by hand, the white cake got a few air bubbles, and in the summer heat the cream cheese frosting stayed soft. My marbling didn’t come out perfectly, more blotchy than swirled. But the cake’s still beautiful. It grabs your attention. And above all, it’s definitely addictive. 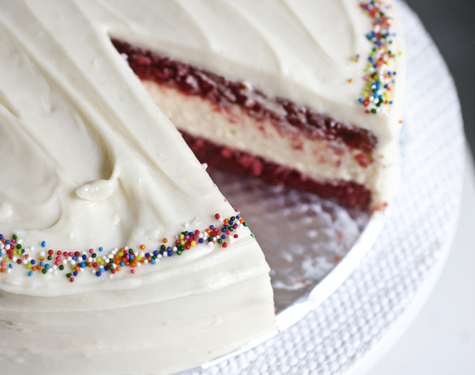 Red Velvet cake, a layer of cheesecake, and cream cheese frosting. August makes me think of peach skin against my lips, of yellowing grass, and inevitably of the coming school year. I remember exactly where I was last August – the kitchen. There were only a few weeks before I moved to Boston for college, and I went into a baking frenzy. In the mornings, I preheated the oven before I brushed my teeth, and I photographed enough desserts to keep the blog alive across the country. This summer, though, I haven’t spent much time baking. I don’t leaf through cookbooks when I’m bored or brainstorm flavor combinations in the car. I’ve lost something I can’t place. Whenever I think about it, unease seeps through me like melting ice. I don’t know why I’ve fallen into a baking rut or how to fix it. “Never going to happen.” I wrapped up the loaf, started on the dishes, and the conversation faded from memory. Now I can’t get it out of my mind. I didn’t spend as much time with my parents this summer as I expected, or as I would have liked. I think the ritual of family dinners would have helped me rediscover that “feeling.” I think tossing ideas back and forth with my dad would have inspired me. Now, it’s too late. Here I am a year later, nine days from my flight, with almost nothing saved up. This semester I’m going to Europe, where baking opportunities will be even scarcer than they were in Boston. I’m so afraid. I didn’t realize it until I typed the words a moment ago, and now it’s more real than ever. I’m afraid of wasting the opportunities I’ve been given. I’m scared of failing. I’m scared that I have burnt out, and that I can’t recover. But I am more than my insecurities. I know that when I put my mind to something, I can make it happen. I have the strength to pull through baking ruts, to breathe life into my writing, and to conquer fear. I’m afraid, but I’m also more passionate and determined than ever. D- is a new friend, but already a good one, and his first visit to Seattle is wrapping up in a few days. I wanted to make something really special to celebrate his 19th birthday and last night in the Emerald City. This week I rediscovered the process of finding The One. 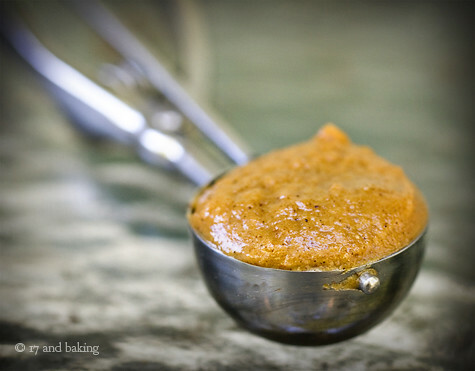 You know, The Recipe that is everything Your Friend would want, their sweet tooth soulmate. 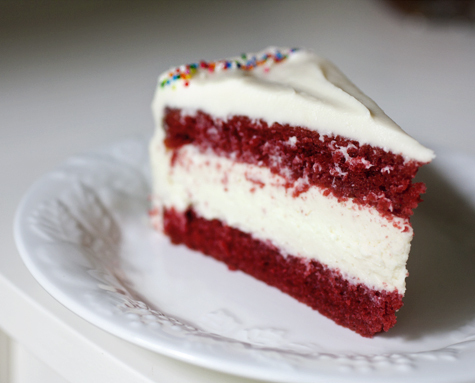 I remembered that his favorite cake is red velvet, but his favorite dessert is cheesecake. I immediately wanted to combine them. 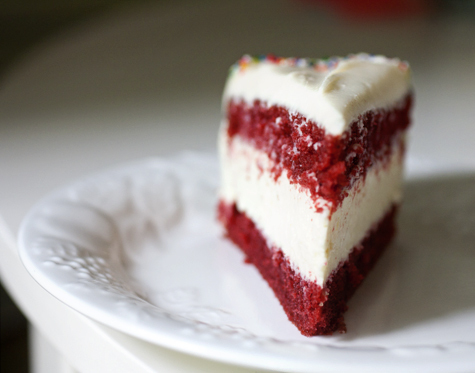 I’d seen red velvets split by cheesecake on several other sites, but that didn’t make it less special. The excitement mounted as I bought ingredients at the store, while I creamed butter, when I scattered sprinkles across the frosting. But everything became clear when I eased the first slice onto a plate and passed it to D-, drank in his expression of surprise and joy. The thrill! It lit me up like a sparkler – burning slowly, but unbelievably brightly. I almost forgot that feeling, but now, all I want to do is relive it. I’m an addict. 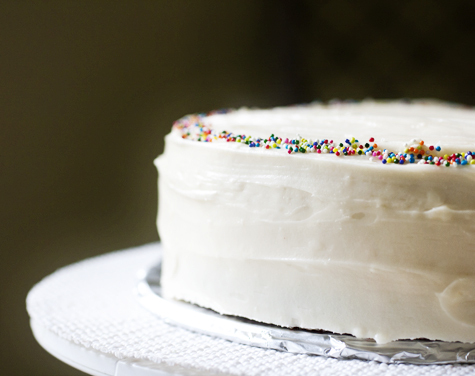 The cream cheese frosting is thick, tangy, and sweet, just like I like it. The cheesecake is dense and creamy. 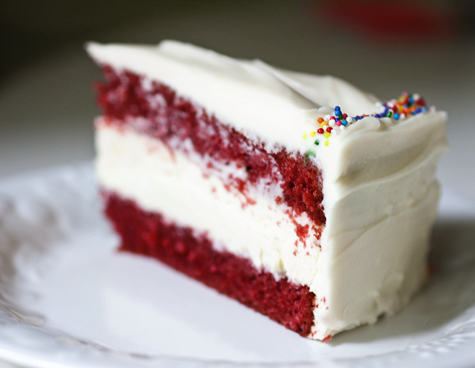 But the star is the red velvet. Heartbreakingly red, soft as satin, fine-crumbed and fluffy… As I watched him scrape the fork across the plate, I couldn’t wait to come home and share the recipe with you. I never lost the passion. I just had to stop taking it for granted. I’ll probably be on the east coast when the next post is up – thanks for staying with me. See you on the other side. It takes exactly two minutes to walk from my dorm building to the restaurant where I work. I know this because I usually tumble out of bed, still sluggish from my afternoon nap, and throw my work clothes into a bag. I half-jog, looking down at my watch at every intersection. In the basement I twist my hair into a side ponytail and tuck a bundle of pens in my apron. I step onto the floor, barely on time. You’d think I’d learn, but I frequently forget to eat before realizing my shift is in five minutes. Most days I arrive at the restaurant on an empty stomach, thoroughly unprepared for the physical and perhaps emotional stress a nine-hour waitressing shift demands. I’m not really supposed to snack while working, and I don’t have time anyway between running plates and dropping checks. It takes me six minutes to walk back from the restaurant. I’m considerably slower on my feet by the time I’m through. Eight months experience and I’m still unused to the soreness that seeps into my body at the end of the night. Sometimes the rumbling in my stomach distracts from the tenderness of each step home. One night, after a particularly taxing shift, I walked straight to my boyfriend I-’s room and pounded on the door, still in chocolate stained work clothes. “I really need to eat,” I said. It was 1:15 am on a Thursday but he shook off the sleep and grabbed his keys. “Wherever you want to go,” he replied, and then we were back outside. For whatever reason, the sundae came out before the meal. Just a few scoops of store-bought vanilla ice cream, with a quick drizzle of chocolate syrup and a ruffled dome of spray-can whipped cream. For a second, I considered not eating it. But then my hand automatically reached for a spoon and dug in, beyond caring. I don’t know if it was hunger, exhaustion, or the happiness that overcame me sitting with I- in that empty restaurant, but the first bite comforted like cool watermelon juice in August. I scraped the spoon against the bottom of the bowl. The food that followed was predictably satisfying, but when I look back on that night, what I remember is the sundae we demolished. Since then, I- texts me throughout my shifts – “Do you want Chinese, pizza, or Mexican when you get back?” Whenever I can, I try to bring him something back from the restaurant in return. Usually, it’s a cookie. The cookies at our restaurant are tangible temptation beneath a glass cake dome. They don’t often last, but if any remain at the end of the night, I snag a peanut butter cookie for myself, a sugar cookie for I-, and triple chocolate for I-’s roommate D-. Mine usually disappears in the six-minute walk back. I’m a quiet fan of the cookie. They’re irrefutably a childhood staple, considering that at 19 years old, I experience nostalgia when I eat them. I think of the butter cookies my grandma and I made for holidays. The coconut sugar biscuits my Chinese teacher offered during recess. 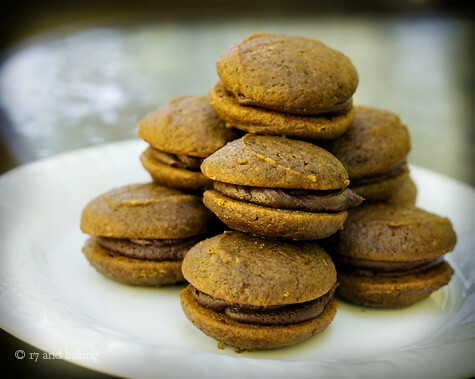 Gingersnaps return me to the 8th grade, sitting Indian-style on the kitchen floor with my nose against the oven’s glass window, watching the tops crack. As much as I like them, I don’t bake many. I get bored scooping mound after mound, or I get frustrated with the capriciousness of roll-out cookie dough (it’s too soft! Too cold! Too sticky!) 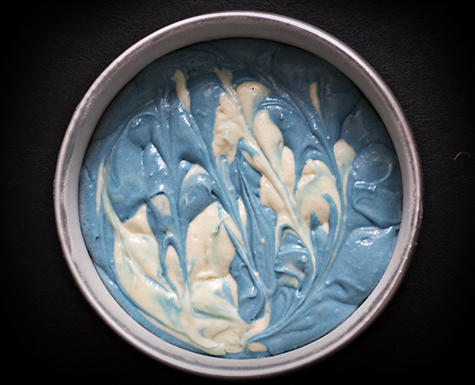 With that kind of time, I’d prefer to pipe buttercream onto cupcakes or delve into yeast-risen territory. 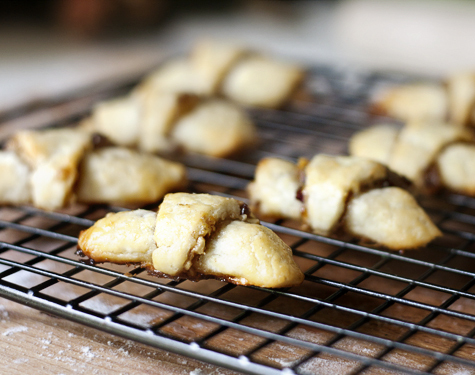 This rugelach, though? Worth it, worth it a million times. As cookies go, these ones are a considerable amount of work. The dough needs to be chilled, requiring some forethought. Then you have to roll out, sprinkle toppings, slice, and bundle into crescent-shaped pillows of brown sugar and apricot preserves. An egg wash coat and dash of cinnamon before the rugelach bakes. But the resulting cookie is pure heaven. 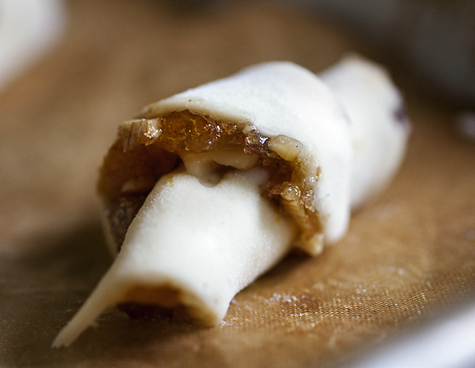 The apricot preserves bubble and transform into a sticky sweet filling, alluring as honey and perfect with milk. 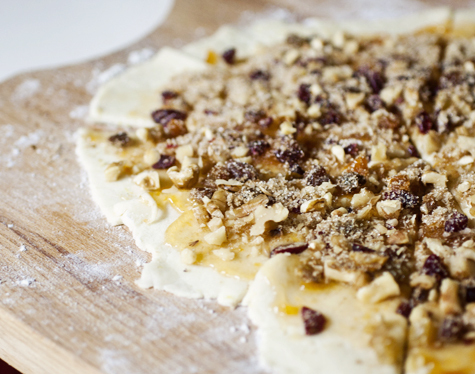 The walnuts add just the right textural crunch. 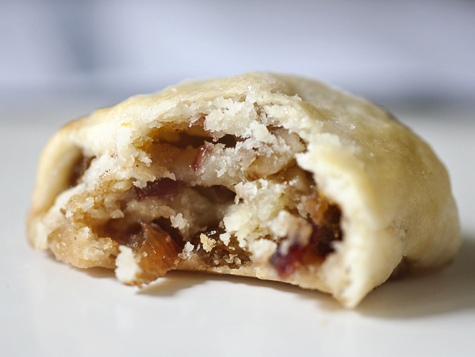 Throw in the moist chew of dried cranberries and the soft flakiness cream cheese introduces? An all around winner. Even better than those peanut butter cookies. Maybe, when I get my hands on a real kitchen and kiss finals week goodbye, I’ll make these cookies for I- and D-. They might not know how much effort goes into them, or how long I spent with floured palms. All they’ll know is that it only takes two minutes to polish off an entire plate, and an afternoon to shake off the smile. I’ve missed this. I’m sitting on a Greyhound bus, long after sundown, and all I can hear is the quiet murmurings of other passengers and the soft clicks as I tap my keys. For the holidays, I’m heading to New York City, and then Pennsylvania, where my uncle and aunt and cousin live. It’s the first time in weeks I’ve had some quiet time to myself, without an assignment or shift or appointment. I’ve missed being able to sit alone with my thoughts and write. Classes ended this afternoon, and it was unusually quiet on the floor today. Everyone was packing up, unplugging their lamps and emptying their fridges, stopping at every room down the hallway to say goodbye. We’re spreading out from California to Maine, retreating back to where we came from. It’s Thanksgiving break, and even though I’m not flying back to Seattle, it’s got me thinking about home. I haven’t been in a bus or car in a long time. Back home I used to love, love, love driving alone at night – the way every turn of the car feels smooth and controlled, the open silence on the road, and the glittering pairs of lights in every direction, like cat eyes. Right now, in the dark, it’s easy to imagine I’m in Seattle. I look out the window and realize we’re on I-90, and that if we just kept driving west on this freeway until we hit the opposite coast, I’d be back. It’s not that I’m homesick, because I’m truly not. There’s a soft spot in my heart for Seattle, but at the same time, home is in people, not places. Home is my mom, drinking jasmine tea on our patio. It’s my dad, who’s flying to Pennsylvania for Thanksgiving. And it’s the people on my floor. I can feel myself falling for the incredible people I’ve met here, and as everyone moves out, I can feel bits of my home scattering across the country. I’m reluctant to leave them, even for a week. But I see the details of my old life everywhere. It’s begun to rain in Boston, a damp downpour that feels like hot breath on your neck. It makes me think of how green the air smelled and how dark the pavement became in Seattle. Sometimes, in line at Starbucks, I forget where I am. Then I step outside and suddenly realize I’m far away… watching the trees exhale burnt orange and crimson, the kind of seasonal change I always said I wanted to experience. The other night at the restaurant, I decided to make small talk with one of my tables. They said they were just visiting Boston, and that they’d flown in from – Seattle. We talked a little longer and discovered that we live in the same region. In fact, their daughter goes to my old middle school, is in my gifted program, and is learning from my old teachers. I’d have never known, if they hadn’t sat at this restaurant, at this time, in my section. I’m excited to spend time with my family, especially since I don’t frequently see my relatives on the east coast. I can’t begin to describe how excited I am to eat some real food. My college has been hosting Thanksgiving themed dinners, and somehow their canned cranberry jelly and paper-dry turkeys don’t do my favorite holiday justice. And I’m ecstatic about getting some baking done. Even though I have all my tools and supplies, and even an oven if I walk to another dorm, I haven’t had time to buy ingredients or spend time in a kitchen. 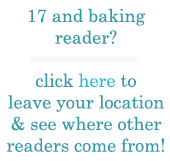 It’s strange that people here are getting to know me without baking being a huge factor in my life. Maybe at the end of this weekend, I can bring a box of sweets back to my floor. I’m thinking whoopie pies. I’ve met plenty of New Englanders here who are dead serious about the whoopie pie. Every time I hear someone get defensive about the dessert’s origin or characteristics, I can’t help but smile. There aren’t a lot of whoopie pies on the west coast. Plenty of people don’t know what they are – just two soft cake-like cookies with some sort of filling sandwiched in between. While I’ve never had a “real” whoopie pie, I can tell you that these ones taste pretty incredible. Especially after a chill in the fridge, with a tall glass of cool milk, a scattering of crisp leaves at your feet and a friend at your side. 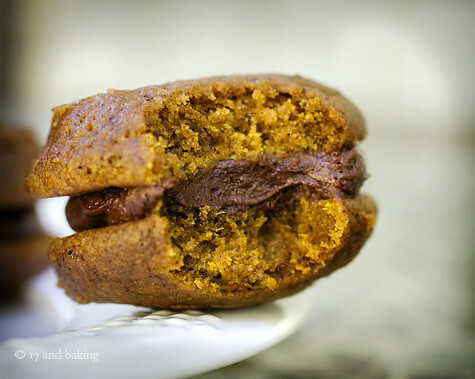 I made these pumpkin whoopie pies with chocolate cream cheese filling before I left for college, and they strike such a great balance of richness and spice. 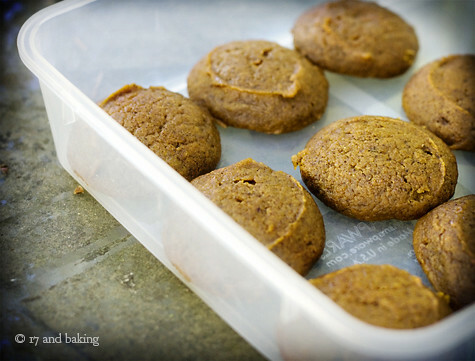 The pumpkin cookies are soft and tender, dense, dark with spices, like autumn in your mouth. As for the chocolate, I just can’t get enough, and the cream cheese filling adds a bittersweet tang to complement the cookie. If I make these again this week, it’ll probably remind me like crazy of Seattle. I’m not sure yet if that’s a good or bad thing. Whatever the case, it’ll cheer up my floormates, and bring a little bit of one home to another.